I love libraries, bookshops, even a pile of books to look through will do. And I like hotels with a decent library. Most hotels I stay in, whether up-scale, flea-pit or somewhere in between, don’t have libraries. A couple months ago, I was staying at the Z Hotel in Puri, Orissa, India, one of my favorite hotels. 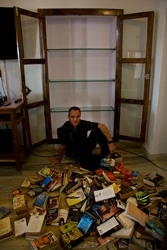 The staff were cleaning the substantial hotel library. Puri is humid and all manners of book-devouring insects thrive there. The titles lining the shelves of the second hand bookshops on near-by C.T. Road end up, evenly I’d guess, in the hands of readers and the jaws of termites. Were it not for the diligent staff at the Z Hotel, where a fair cross-section of world literature, from highlights (classics, Graham Greene and Kerouac) to the lowest common denominators (Grisham, Michener, McEwan, The Bible et al), is available for guests, the hotel’s books would likely suffer a similar fate. I think, over several visits, I have read most of the trash and some of the respectable reading matter on offer, though I have passed on the Bible. Reading in this climate – the Indian coast on the Bay of Bengal is fantastically wet in the summer – is risky business. It’ s most upsetting when you get to the last chapter of that gripping if moldy Lord Jim or Men are from Mars and Women are from Venus and the lower halves of the remaining few pages have been digested by an invisible army of critters. One day, I plan to return to the Z Hotel to train Puri’s termites in the rudimentary appreciation for reading matter, so that in future, they might chomp through Ludlum, but leave Conrad alone, devour Christie’s Poirot with gusto but stay well away from Houellebcq’s Possibility of an Island, never hesitate before turning Coelho and Grisham into protein and then sawdust, while circumnavigating the works of JG Ballard, Amitav Gosh, and resist all but a nibble of Arundathi Roy. Once the termites have mastered all this, they are ready for the post-modernists. By that time, no one will read books any longer and termites, having long gotten used to a staple diet of trashy reading, will perish.